Rehabilitation is a highly valued discipline in human medicine. It is a physical rehabilitation practice which aims at improving physical mobility, agility and comfort, as well as providing pain relief and speeding recovery after an injury or ailment. With the many benefits it provides, it’s not surprising it has become increasingly popular in animal rehabilitation over the last decade. 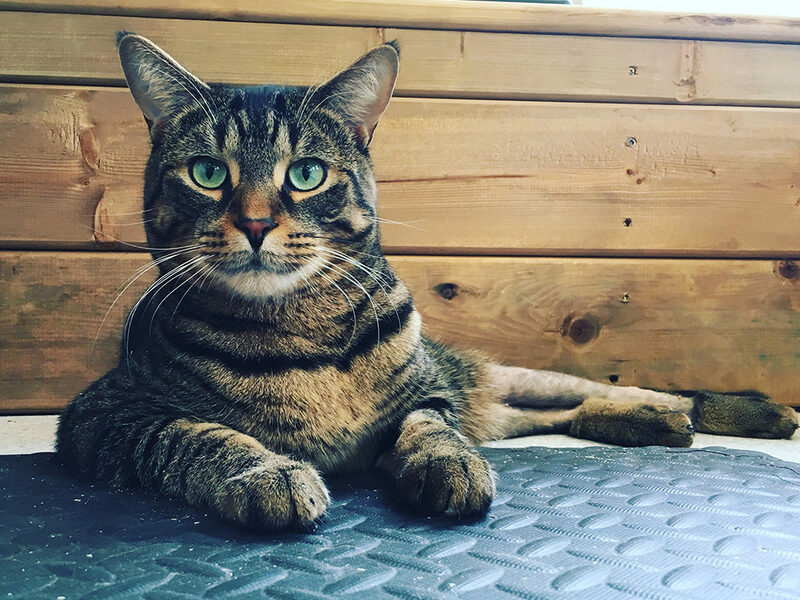 Although rehabilitation is well-established among canine patients, it has grown in demand for feline counterparts in recent years. Many of the rehabilitation techniques and treatments used on human patients have been adapted for use in animal therapy and have proven to be highly successful in speeding healing and recovery — as well as improving a pet’s overall range of motion and well-being. Find out how rehabilitation can be beneficial for your beloved feline friend, and why you should consult a healthcare practitioner to determine which treatment option is best suited for your pet. Rehabilitation for cats: how is it different? 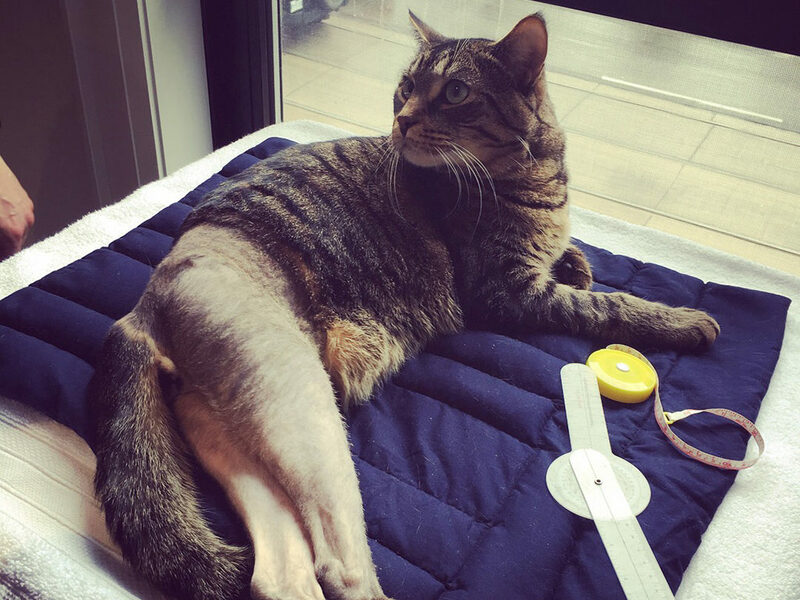 Although cats can also benefit from effective rehabilitation techniques and rehabilitation programs, their compliance with regards to treatment is often less predictable than with dogs due to their independent nature. The success of rehabilitation among cats requires a thorough understanding of feline behavior, coupled with excellent maneuvering skills. As with dogs, compliance can often be enhanced through the provision of enticing rewards (i.e. treats and play opportunities). The advantages of rehabilitation for cats are multifold. While the latter are generally less affected by injuries than dogs, rehabilitation can be extremely beneficial following orthopedic or neurological surgery, and for other acute and chronic disorders (i.e. muscle, tendon or ligament injuries and arthritis). – Reduce inflammation, discomfort and pain. – Speed wound healing and scar formation. – Promote early weightbearing and prevent the development of compensatory gaits. – Restore full range of motion and mobility. – Accelerate normal function and movement patterns. – Prevent the development of adhesions, fibrosis and contracture. – Restore muscle strength, endurance and balance and regain optimal function. – Prevent the development of hyperalgesia or other chronic pain. In addition, it can also have a useful role before surgery by physically and mentally preparing the animal for surgery, as well as familiarize the owner and his pet with the exercises and care required after surgery to ensure a smooth post-operative recovery. What types of cat rehabilitation programs are available? Commonly used in humans, manual therapy involves the manual manipulation of muscles and tissues for healing. These manual techniques (such as soft-tissue massages, passive movements, stretches, Range of Motion (ROM) exercises, heat-cold therapy and joint manipulations) can be performed by specialized animal rehabilitation practitioners. These techniques both aim to reduce pain and improve a pet’s range of motion. Electrophysical treatments are non-invasive and non-painful treatment options, and include the use of laser, therapeutic ultrasound and electrical stimulation. Laser therapy and thermal ultrasound are primarily used for pain relief, wound and tissue healing, and to reduce inflammation; Electrical stimulation can also prevent muscle atrophy for animals who are generally not very active. Therapeutic exercises form an integral part of the rehabilitation process. They optimize a pet’s overall health, fitness level and well-being through a series of strengthening, flexibility, balance and endurance exercises such as running, uphill and downhill walking, body weights, and more. Moreover, they help prevent long-term physical impairment, enhance muscular mass, and reduce the risk of future injury. Depending on the degree of injury and level of strength of the cat, the use of additional equipment such as slings, harnesses, or carts may be required. 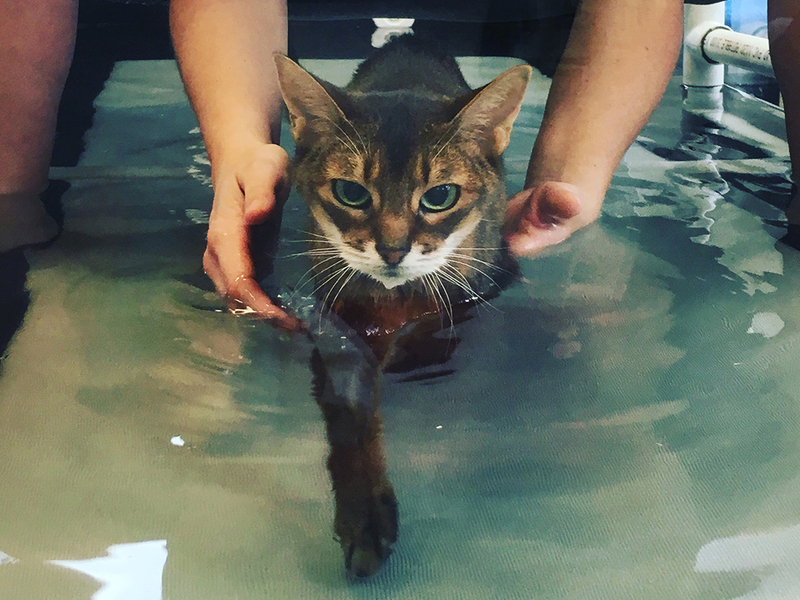 Last but not least, thanks to the therapeutic properties of water, underwater treadmill therapy can help rehabilitate soft tissue injuries, postoperative fractures, neurological impairments, osteoarthritis, muscle weaknesses, geriatric care, as well as aid with weight loss and physical conditioning without putting excess stress on the joints. Contrary to popular belief, cats can utilize the underwater treadmill too! 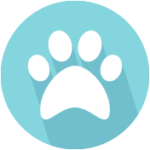 A smooth introduction and a compliant cat will tolerate and reap all the underwater treadmill benefits a dog or other animal does. No matter which of the above techniques is used, it is important that the cat be in a relaxed state in order to fully benefit from any treatment. Cats that are fearful, stressed or in pain will less likely respond to these treatment options, although in many cases relaxation can be achieved as an effect of the technique itself. Feline rehabilitation practices have become increasingly popular in cat rehabilitation in recent years. Certified technicians and healthcare practitioners are skilled at recognizing pain and identifying symptoms in feline patients. Based on the prognosis, they can prescribe and implement the best rehabilitation treatment for your cat to maximize results and return the patient to optimal function as quickly as possible – and that treatment is performed safely without risk of aggravating your cat’s condition. The rehabilitation program will vary according to your cat’s needs and may involve a combination of a few treatment options listed above.